Key West Bed and Breakfast; Andrews Inn Key West, A Tropical Bed & Breakfast Check out our specials! *Offers valid for Reservations before December 15, 2008 only and do not include holidays and special events Green Lodging FloridaTo reach this charming Key West Bed & Breakfast, you wander down a shaded lane just a few steps off Duval Street. Andrews Inn Bed and Breakfast immediately offers peace and tranquility as you enter through a garden gate to our secluded world. A shimmering pool is nestled in a lush tropical garden of coconut palms, Spanish lime, hibiscus, and jasmine. Our inn is secretly tucked in Hemingway's Backyard, and the only thing that separates us is the wonderful red brick fence. 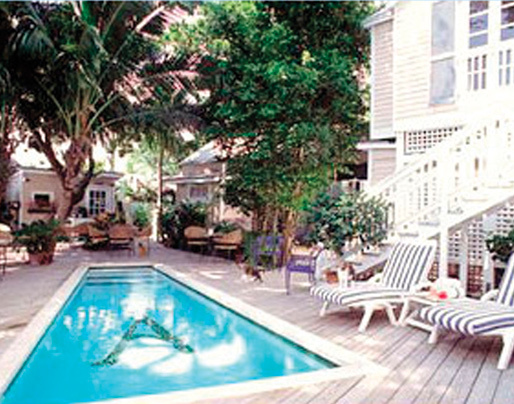 Andrews Inn Bed and Breakfast Key West embodies the unique beauty of Key West and is proud to be recognized as one of the first Florida Green Lodges in the Florida Keys. We are also only a short walk to the Atlantic Ocean & the Gulf of Mexico and just steps away from the finest shops, restaurants & nightlife on the island. Key West B & BMain Guest House All of the guest rooms surround the shimmering pool and are beautifully appointed with white wicker furniture, tropical dÃ©cor and a unique collection of artwork. Enjoy a champagne continental breakfast and full cocktail hour daily while relaxing in our tropical oasis. If you are in an active mood, let us book you any snorkeling, diving, sailing & fishing adventures that Key West offers. Andrews Garden Cottages Key West Bed and Breakfast Relax in paradise amongst all the comforts of home in one of Andrew's Garden Cottages. Just one block from the main inn, our cottages offer the ultimate in privacy and luxurious island living. All of Andrew's cottages are recently renovated Bahama-style homes that feature an outside patio or terrace, Jacuzzi, and tropical gardens. It's hard to believe that this peaceful setting is in the heart of Old Town. With our broad array of rooms, suites and cottages, we're sure to offer the perfect setting for your Key West vacation. We look forward to welcoming you to the most comfortable and affordable accommodations on the island.